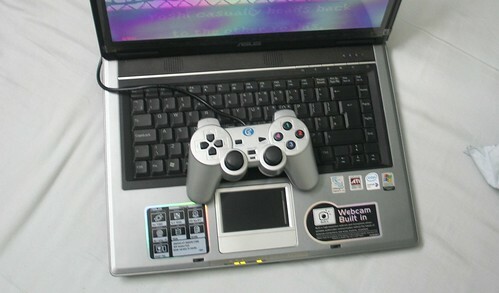 I use a fairly powerful laptop at home. It’s not exactly a gaming laptop but it has a pretty powerful gaming card (ATI X1600) and uses dual core (Duo T2300E) processor. In short its a great machine to play classic Sega/Nintendo games of yesteryears’ through emulators. Increasingly I have been concerned about the life of my laptop keyboard which I have found, unlike the desktop keyboards, could be quite easily jammed (especially if your 10 year old cousin is banging on Enter key yelling ‘MAAARREYO’). The prices range from Rs. 450 (Chinese make incl. Shipping) to Rs. 1100 (Logitech Dual action) online. I also read accounts of people who went for Logitech and lost their calibration in a few months and accounts of people who have been using cheap gamepad for the last 3 years. Sega Genesis games work well with the joystick in Analog mode. 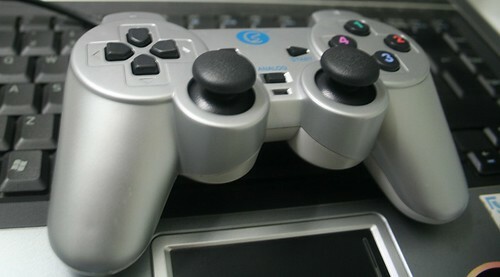 I use the 4 shoulder buttons and right joystick in most cases. Nintendo Gameboy games work well with the left D-pad or HAT switches. It seems to be over-reacting to the joystick. Could be an emulator problem though. I found it more easier to hold it tilted forward when playing these games. All in all, it has been a good value for money. I can now literally sit back and play my game collection with much better controls and stop worrying about my Pandora.